The Galapagos Islands are home to some of the most unique and biodiverse marine life worldwide, including many species that can be found nowhere else on Earth. Globally, there are over 400 known shark species and 32 of these have been recorded as being present in Galapagos. Sharks can be found throughout the waters surrounding the Islands, however the largest concentration can be found in the northwest around Wolf and Darwin islands; this area was recently confirmed as having the highest abundance of sharks in the world! Measuring only one metre long, the bullhead shark is the smallest shark seen around the Islands. Found only in Galapagos and along the west coast of Peru, little research has been done into this species since their discovery, leading to them being labelled as Data Deficient by the IUCN (International Union for the Conservation of Nature). However, this is changing thanks to a current project supported by GCT. 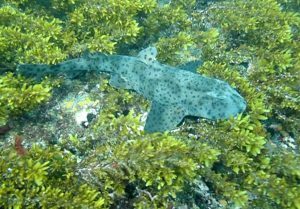 The project aims to generate current and accurate data on the population and distribution of the species, to evaluate its IUCN status and to determine whether the Galapagos bullhead shark and the Peruvian bullhead shark are separate species. What makes this project particularly special is that it involves the wider Galapagos community including tourists who can photograph any bullhead sharks they encounter and upload the photo with details to www.bullheads.org. Individual bullhead sharks can then be identified by the unique patterns on their backs. By involving citizen scientists, a much wider range of data can be collected which will create a more accurate model of the population size and activity. Named after their iconic hammer-shaped upper body, hammerhead sharks are one of the most famous shark species globally. New-born hammerhead shark pups average a length of just 50cm but can grow to reach the impressive length of four metres. The eyes are found on either side of the shark’s head, giving it a 360◦ view of its surroundings, which is useful for spotting prey, though unfortunately the position of the eyes leaves the shark with a considerable blind spot immediately in front of its nose! Unlike some other species, the scalloped hammerhead shark is very social and the Galapagos Islands are one of the only places where these sharks occur in large schools. Over 100 individuals can be observed schooling around the Wolf and Darwin islands. The typical diet of a scalloped hammerhead consists of fish such as sardines, herring and mackerel, but they also occasionally feed on invertebrates such as octopuses. Large scalloped hammerhead sharks also eat smaller shark species such as the blacktip reef shark. 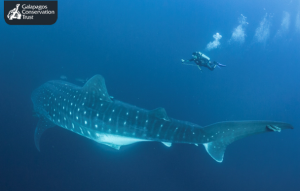 As its name suggests, the whale shark is famous for its huge size, closer to that of a whale than any other shark. The longest reported length of a whale shark was 18 metres, making it by far the largest species of fish in the ocean. The average size is lower than this, at 12 metres long and weighing 15 tons, but is still equivalent to the size of a bus! The whale shark prefers to live off a diet of plankton and is a filter feeder. The method of filter feeding includes suctioning a large volume of water into their large mouths and filtering it through pads by the gill slits, which contain pores only a millimetre wide that act as a sieve for any food particles. These sharks usually remain in the open ocean, but are can often be found around Wolf and Darwin islands. Unfortunately, a number of threats, both human-inflicted and natural, have led to the rapid decline of shark populations. Sharks grow slowly, mature late and have very few offspring, with the exception of the whale shark which can have up to 300 pups. This means that the rate of population growth is slow and once a population declines, it takes a very long time to rebuild. Furthermore, climatic events such as El Niño and global warming that affect water temperature can be very detrimental to shark populations often affecting the populations of their food sources. While sharks in Galapagos are protected by the Galapagos Marine Reserve, they roam quite far and can be affected by illegal fishing and bycatch in fisheries targeted at other species which are two prevalent reasons for declining shark populations globaly. By raising awareness about the threats faced by shark populations today, we can aim to eliminate these dangers and protect the future generations of these fascinating ocean dwellers. There are several ways in which you can get involved! If you’d like to find out more, there is additional information on Galapagos shark species here. 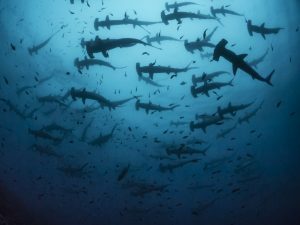 To help protect sharks in Galapagos, you can donate to Galapagos Conservation Trust, become a member or even adopt a scalloped hammerhead shark.